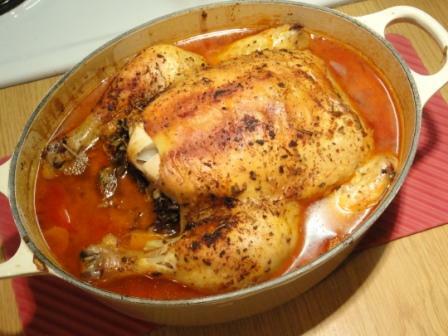 For the ingredient challenge I decided to use the Spanish Chicken recipe from Le Creuset as a base. I could not follow the recipe exactly as one of the guests we were having for dinner does not eat pork and so I substituted the chorizo. I was fortunate enough to have a friend with an oval Le Creuset casserole but if you don’t have one you can use any large casserole dish with a lid. That looks and sounds wonderful, Tandy. I love the sound of a Moroccan Lamb sausage, but don’t recall seeing it here. Very good take, My bad, I just haven’t had the time, may do the challenge tomorrow, if it’s not too late? Belated Friday greets to The Hunk. Brilliant recipe Tandy and I love the idea of the Moroccan lamp sausage.